By Jason Kim: Without having fought any heavyweights other than Tomasz Bonin a year and half ago, former cruiserweight champion David Haye (21-1, 20 KOs) must feel that he’s the luckiest fighter on Earth. The reason is simple. Haye, 27, only has to face one fighter, who at the moment is a fighter by the name of JD Chapman, and if things go alright for Haye then he gets an almost guaranteed title shot against IBF/WBO heavyweight champion Wladimir Klitschko in 2009. Not bad for someone who’ll by that time will have had all of two heavyweight fights in the division. Haye, however, has been shot up to the top of the WBO and WBC rankings in the past couple of months largely due to his cruiserweight credentials rather than any real performances as a heavyweight. Although I’m sure the ranking bodies had a reason for catapulting Haye above more established heavyweights that have been waiting a lot longer for a title shot than Haye, it seems more than a little unfair from my perspective. I’m no expert on how the ranking organizations come up with their decisions on how to rank someone, but the fact that Haye was pushed up so quickly, strikes me as if it were a popularity contest rather than a true ranking of the potential of a fighter. I’m quite certain that Haye will be a fine heavyweight someday, because he seems to have all the tools - size, speed, confidence and a lot of power - but I don’t know that he’s already better than heavyweights like James Toney, Tony Thompson, Monte Barrett, Denis Boytsov, Kevin Johnson, Chris Arreola, Travis Walker, Kali Meehan or Oleg Maskaev. I think Haye might be able to beat some or maybe even all, but unless he showed that he could beat at least a few of them, I don’t see how he can be ranked above them. They, at least, have fought at heavyweight for awhile and in most cases, they’ve beaten more than a few good fighters between them. Haye, however, has yet to beat one heavyweight that I consider good. And if Haye gets his wish and sets up a fight with Chapman, a fighter with wins over virtually nothing but C-class fighters, then I would still assert that Haye has yet to face a good heavyweight, and thus by extension he doesn’t deserve a fight against Klitschko. I think Haye is more than good enough to knock Wladimir out, because the Ukrainian fighter has a very weak chin and fights timidly most of the time nowadays. He didn’t always fight that way, and perhaps a younger version of Klitschko would be trouble for Haye, but that fighter now longer exists now. Emanuel Steward has taken that out of Wladimir and made him into a weaker Lennox Lewis clone. I don’t, however, feel as confident that Haye could defend his title for long without getting stopped by one of the many challengers that would be trying to take what he got. All it takes is one fighter with a chin and halfway decent power, and Haye, with his glass jaw, will likely be giving up his title as easy as Wladimir probably will to him. 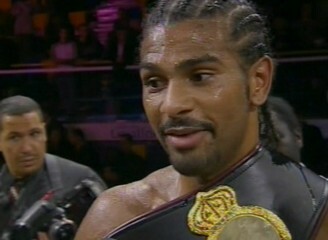 Even though he’s good enough to beat Wladimir, that still doesn’t mean that Haye deserves the shot. If it were up to me, he would have to beat someone a whole lot better than the likes of JD Chapman or Tomasz Bonin to get a title shot against Wladimir. Ideally, he should be made to have at least five to ten fights in the weight class before being allowed a title shot. That way it would dissuade the nasty practice of big named fighters hop scotching from division to division in order to escape harder competition in their normal weight class, and to pick up and easy title shot against a fighter more to their liking.